Mama, Is It Summer Yet? Yes, Happy Solstice! 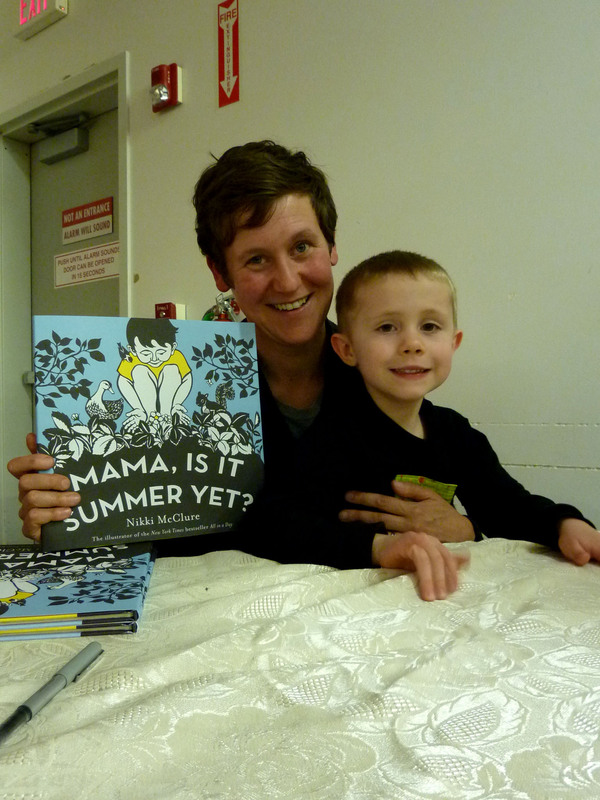 We were lucky enough to see Nikki McClure read her new book Mama, Is It Summer Yet? at Powell’s at the beginning of May. Nikki’s art work was also featured in the Pearl Room at Powell’s. Her paper cuts are beautiful in her calendars and books, but they were exquisite in person. Henrik really enjoys All in a Day, but Mama, Is It Summer Yet? has moved onto his current list of favorites. Henrik has been asking since winter (on the few days that we saw the sun) if it was summer yet. Once we got Nikki’s book we were able to start talking about the signs of summer’s arrival and whether it was summer or still spring. Rob just read Mama, Is It Summer Yet? to Henrik tonight to celebrate the Solstice. Even though it was a pretty grey day, Henrik was glowing with the knowledge that summer had finally arrived, at least officially. Thank you for writing the book and for coming to Portland, Nikki! 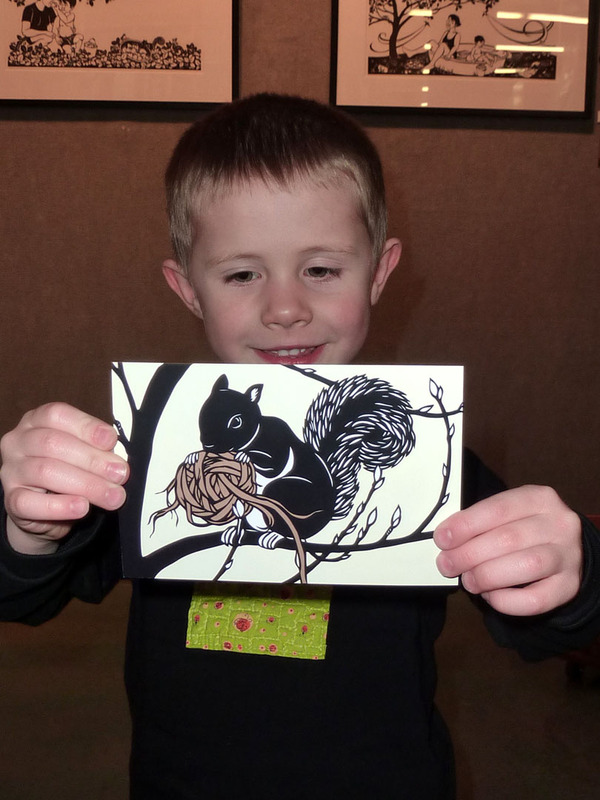 Henrik loved the squirrel postcard. Nikki signed Henrik’s book and was gracious enough to pose for a picture. Nikki is teaching a paper cut class, Crafting a Memory: Making a Paper Cut Story, at the North Cascades Institute in August. There were a couple spots available when I looked into the class about a month ago. I have been working on a board book and paper cuts would be the perfect medium for the illustrations. I am not going to be able to make the class this year, but maybe if it is offered again next year…. We woke this morning to beautiful summery blue sky outside our bedroom window. But, the grey had settled in again before breakfast. At least our hope was refreshed that more blue skies are in our near future. I hope you enjoyed at least a glimmer of summer today. Happy Summer Solstice! This entry was posted in Beauty, Local, Read, Seasonal. Bookmark the permalink. This entry was posted in Beauty, Local, Read, Seasonal, Uncategorized. Bookmark the permalink.